anything we could not provide. RIGHT NOW! 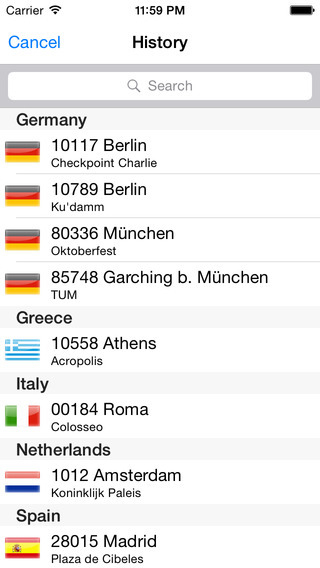 Check it out [url=itms://itunes.apple.com/de/app/iebt-euro-bill-tracking-made/id409716509?mt=8]in iTunes[/url] or on the AppStore Website. As of Version 1.9 (Jan, 11th, 2015) iEBT is a completely FREE app. ★ Offline storage. Enter your notes on the go and submit dem later! ★ Super easy note submission to EuroBillTracker.com! ★ Powerful Keyboard Switching for the fastest note entry experience! 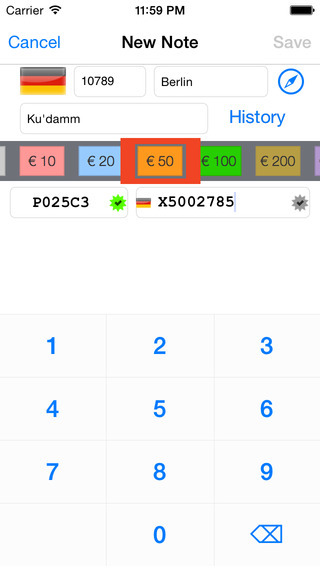 ★ Easily submit your euro notes to EuroBillTracker.com wherever you are, whenever you want! ★ Interactive note validation with instant feedback! ★ Location history for quick access to and easy entry of recent locations! 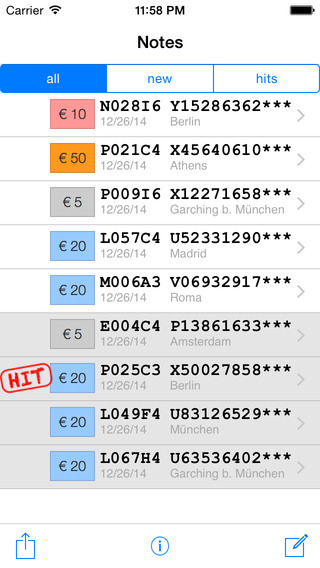 ★ Hit and Duplicate note detection! ★ [NEW] Serial and Printcode Lock Feature to assist with semi-sequential or fresh notes. ★ [NEW] Tiny Flags to indicate the region where the note has been printed and the country it has been printed for. ★ using the eurobilltracker API more. ★ Corrected some localization issues. ★ The last used GPS position is shown on the map. ★ Support for the new euro notes. For questions, suggestion, wishes or comments, reply below or send us an email to iebt@lichtzwerge.de. PS: Tell your friends and share the love! PLEASE NOTE: We are not (yet) affiliated with EuroBillTracker.com or the European Society for EuroBillTrackers. Thus we cannot and do not want to claim to be the official EuroBillTracker App! Last edited by kKeks on Tue Jan 13, 2015 6:55 am, edited 7 times in total. Re: iEBT: The iPhone App. I see you charge money for the program... Does this go to the association, or to yourself? Crazy Bob wrote: I see you charge money for the program... Does this go to the association, or to yourself? we are not (yet) affiliated with the European Society for EuroBillTrackers. Btw, looks like a lot of people tackled the same problem at the same time. There will be a special mobile version of the EBT website very soon, hopefully still this year. Please keep in mind that it is still in development. Don't hesitate to give me feedback or to tell me if you have some ideas for improvement. Last edited by Jackgaillard on Thu Dec 23, 2010 7:17 pm, edited 2 times in total. That is sadly right. I'm very sorry that we do not provide iOS < 4.0. It is very unfortunate that Apple does not provide iOS 4 for the old generation iPod Touch. Re: iEBT: The iPhone and iPod Touch App. Awesome! It fits very well with my new iPhone4. Thank you very much. Hits | Intercontinental hits with Brazil and Morocco! Will this app also be available on Android Market, I use with Galaxy S9000 ? I bought the App yesterday and entered my first notes today. The App worked very good. It's easy to handle and definitely worth the €1,59 it costs. €€F wrote: Will this app also be available on Android Market, I use with Galaxy S9000 ? Sorry, we will not port it to Android. But Marvin is developing an Android app, you can find it here. I'm pleased to report that iEBT 1.1 has been approved by Apple. We've added a bunch of new features and improvements. [NEW] Serial and Printcode Lock Feature to assist with semi-sequential or fresh notes. [NEW] Tiny Flags to indicate the region where the note has been printed and the country is has been printed for. We'd love to hear your questions, suggestions, wishes and comments! I'm very glad you like it. Would you mind sharing what you like best? And what would you love to see added?